Cost pressure in companies, especially in production, is increasing. At the same time, the variety of products is growing. KBA-Metronic’s modular software suite code-M for efficient product coding, helps to reduce costs and simplifies individual design options. alphaJET continuous ink jet printers mark products with date, texts, marking lines up to complex barcodes contact-free. Each printer can be controlled directly from the control panel. Once production lines are networked, operations involving manual printer handling often run up against limits. Frequently changing products can cause additional errors in manual operation and control. Typing mistakes or incorrect configuration lead to unpleasant consequences. For many years now, KBA-Metronic has been simplifying the optimization of production processes by integrating a hand-held scanner. The software suite code-M complements the increasing networking of production within the context of Industry 4.0 and enables rapid adaptation to new trends. Thanks to its integration into the corporate network, job order preparation and production planning are directly linked to the printers in the line. The integration of code-M is seamlessly possible for the new alphaJET generation, regardless of whether new or already existing systems. With more than 350 employees in the R & D, production and sales, HEW-KABEL develops and produces customer-specific cables and wires for customers in Germany and worldwide. Its customers include companies in the automotive industry, medical technology sector and robotics, as well as in control technology and energy machine construction domain. Over a period of more than 50 years, the company has developed numerous cable solutions with material competence and a special depth of production. All HEW-Kabel’s products and processes are geared towards fulfilling stringent requirements and consistently manufacturing the suitable product from the wide range of products with a high degree of precision. the variety of cable and wire. Depending on which ink is required, the ink jet printers at the lines are exchanged and configured vis-à-vis the device. Over the course of time, the inkjets were set up in an individual and unclear manner. This is a potential source of errors which needs to be eliminated. Apart from the production line and printers, the code-M editor now makes it possible to use a PC to centrally create the printing texts, which are then stored on the server computer. 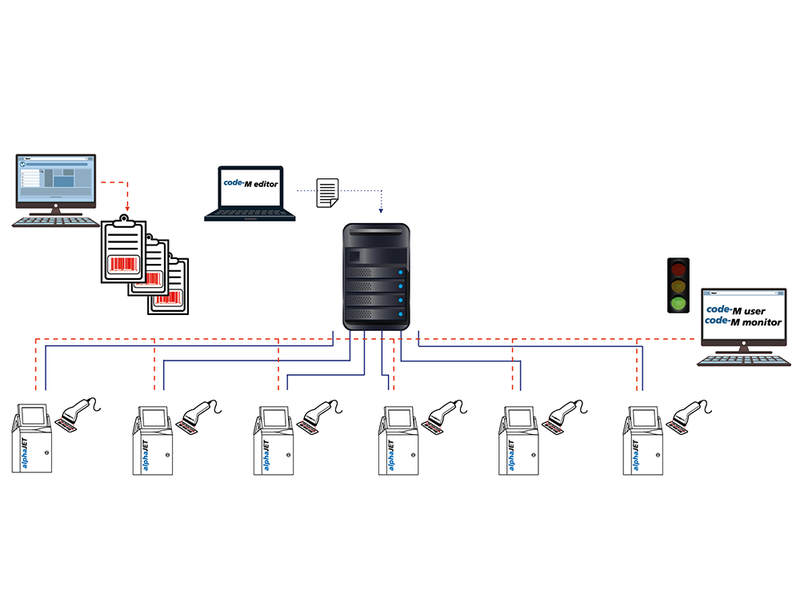 All alphaJET printers are connected to the server via Ethernet; and are synchronised with the latest printing texts in a 5-minute cycle. The production order from the work preparation office carries a bar code. By scanning the barcode, the operator activates the JOB with all correct configuration and printing text directly on the alphaJET. Sources of errors were eliminated by networking the alphaJET through a central server, and by using a hand scanner to activate the print jobs. ink needs to be refilled. All printers can be operated centrally via code-M user. The identical user interface of the printer appears on the screen of the PC.